Miles was full of news when he came back, and sat down at the brunch table, eyeing hungrily the plenty which Hannah, with Cara and Tom’s help, had conjured onto it. Hannah, always glad to feed ravenous offspring, bade him to to dig in, and brought over a platter of potatoes—the final dish—from the stove. They all settled down to eat, and to listen to what Miles had to tell. Snow can be quite beautiful. Those of us who live in wintery climates are familiar with the fact that sunlight shining off freshly fallen snow can be especially beautiful (and dazzling). On a recent weekend in my northern city, we had a cold dry snowfall of about 5 centimeters. While out walking one Sunday, I noticed that the snow was not only displaying flashes of white light, as the sunshine reflected off the drifts, but also many flashes of coloured light. This effect was very evident (and striking) especially while walking - one generally perceives motion or changes due to motion more readily than static phenomena. Though the effect was more striking to the naked eye than the camera, the photos below still give a pretty good idea of what I saw. Note that they are the same photo, but one has been cropped and magnified in GIMP, though no other image manipulation was done. Note also that cameras tend to make snow look darker than it is, because pictures of snow have a lot of contrast, which they try to correct. As you can see, there are quite a number of colours evident in this photo – blues, reds, greens, yellows, oranges, violets. Pretty well all of the colours in the visual spectrum mnemonic that we learned in high school (ROYGBIV), in fact. Outnumbering those, of course, are the white sparkles that we normally associate with fresh snowfalls. So, what causes this colourful display? Basically, it is because the snowflakes in question are hexagonal (6 sided) plates or columns. This geometry ensures that light passes through the snowflake, the same way that it does through a prism. The consequent differential refraction breaks up the white light sunshine into its constituent colours which we then see as flashes of colour as we walk past. 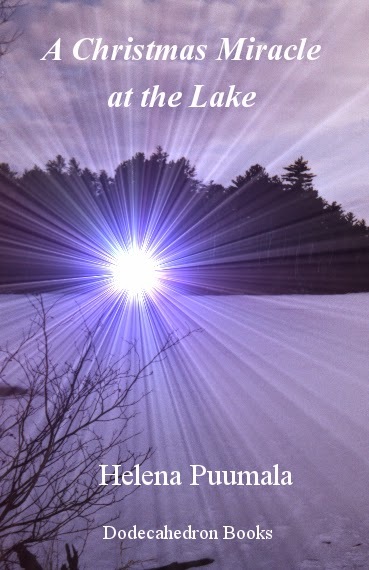 The light rays have to have the proper alignment to end up triggering the colour receptors in our retinas, but that will happen often enough, given the millions of snowflakes and their random orientations on the ground. 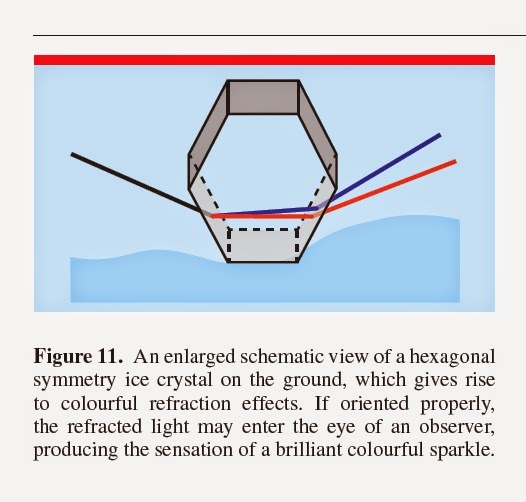 The diagram below gives an idea of how that works (from “Brilliant colours from a white snow cover”, Michael Vollmer1 and Joseph A Shaw2, 2013 Phys. Educ. 48 322). That paper has a lot of interesting data about this phenomenon, along with some very pretty photos. I haven’t noticed this effect all that often in my life, even though I have lived in winter cities all my life. That's because a particular set of circumstances must come together to create the effect. A combination of cold, dry, windy weather (temperatures were -20 C or less), producing “platy” snow, followed by bright sunshine seems to do the trick. As noted, the snow has to have certain geometric characteristics (hexagonal plates or columns), in order to nicely produce the diffraction effects that lead to the colours. A bit of wind as the snow falls ensures that the flakes rest lightly, and in random orientations on the old snow. Then, bright sunshine creates the nearly parallel rays that can be refracted from the snow flakes. Voila – spectacular colours, glittering off the snow. The effect doesn’t seem to last for long – it was quite striking for a couple of days, but after that it seemed like I all I could see were the usual while glints off the snow. As the paper noted above says, morphological changes (caused by snow packing/settling, sublimation, melting, air pollution, etc.) in the snow eliminate the effect in a short while. Of course, if it was too common, we wouldn’t consider it to be as beautiful as we do. By the way, you may wonder why I called this an Astrophysics Corner blog – well, the sun is a star and it plays the key role in this phenomenon. And, for good measure, here is an XKCS comic about refraction. :).